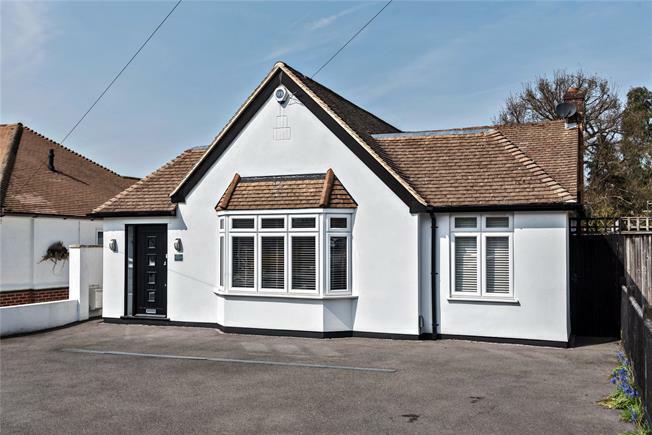 3 Bedroom Detached Bungalow For Sale in Orpington for Asking Price £735,000. We are delighted to offer for sale this refurbished and extended three/four bedroom detached bungalow located in a desirable road within proximity of Newstead Wood and Darrick Wood schools and Orpington mainline station with frequent direct non-stop links to London Bridge and regular direct services to Charing Cross and Victoria stations. The property benefits from a luxurious kitchen/dining room with bi-folding doors opening to the garden and with a sliding door to utility cupboard. Additionally there is a lounge to front, opening to a study/fourth bedroom. The master bedroom opens to a dressing area and benefits from an en suite shower room. There are two further bedrooms with access to a luxury family bathroom suite. To the rear is a large garden with outbuilding converted to substantial office/studio space, fully decorated and with mains power. Family bathroom Large walk-in shower, contemporary fittings, WC, bidet, wash-hand basin set in stone-topped unit with shelved cupboard / cabinet, large heated towel rail, porcelain tiled flooring. Loft Mainly boarded, with additional insulation, Velux windows, lighting. Provides studio space and substantial storage.